In the wake of natural disasters, voters frequently get displaced from their homes. That does not mean that these voters lose their right to vote and have their political voices heard. 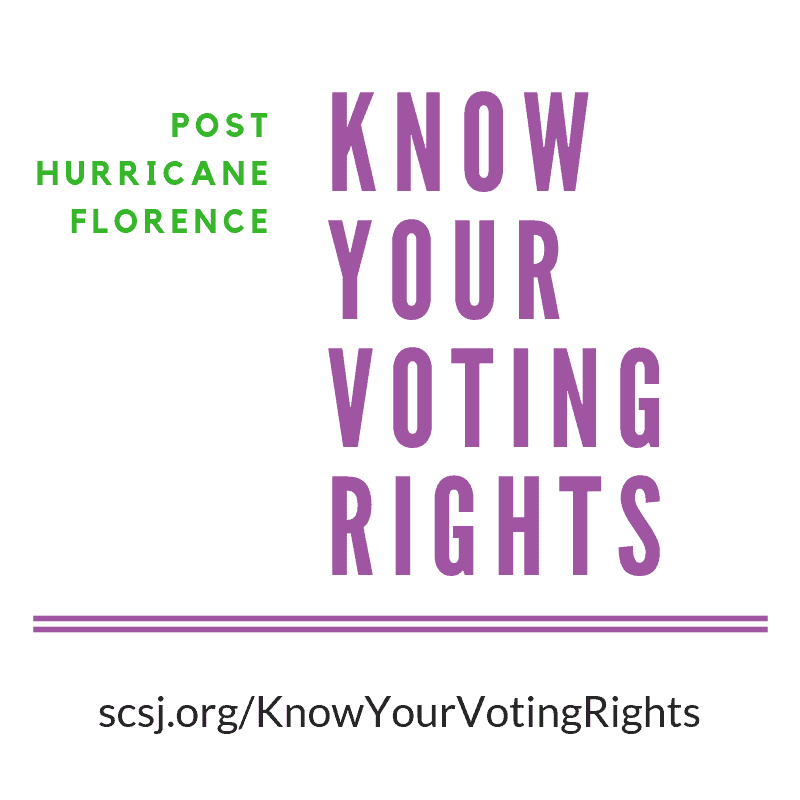 Survivors of Hurricane Florence who have been forced from their homes because of the storm and subsequent flooding have several options available to them to vote this November. Information about your voting rights is below. 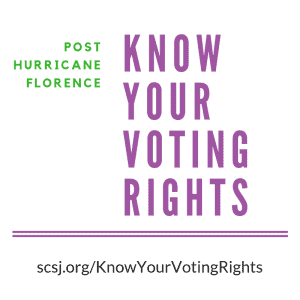 Click here to download a PDF of our Know Your Voting Rights Flier. 1. Voters who have temporarily left their homes and intend to eventually return to the address where they are registered to vote can vote by no-excuse absentee ballot mailed to your temporary address. Any registered voter can request an absentee ballot by submitting an absentee ballot request form in-person or by mail, fax, or email to their county board of elections by 5:00 pm on October 30. The completed absentee ballot and return-container envelope, signed by 2 witnesses over age 18 or a notary, must be postmarked or delivered in-person by 5:00 pm on Election Day, November 6. Voters can vote at any one-stop early voting location in their county from October 17–November 3. Voters can also vote at their assigned “home” precinct on Election Day, November 6, from 6:30 am – 7:30 pm. 3. Voters whose homes have been seriously or permanently damaged, are unsure as to whether they will ever be able to return, and intend to remain indefinitely at their current location have the right to register to vote at their new place of residence. Voters can also register during the early-voting period using same-day registration by bringing proof of residence, such as a utility bill, bank statement, or government document, to any early voting location. * Some polling places may have been damaged by the hurricane and may be subject to change. If you are uncertain as to which option best applies in your situation, please don’t hesitate to contact the Southern Coalition for Social Justice at 919-321-1848.